Guyana is poised to once again become the breadbasket of the Caribbean and further afield, once plans to partner with a group of Brazilian investors bear fruit. The proposal, which has to do with industrialising the agriculture sector, is projected to translate into a mega state-of the-art farm in the Intermediate Savannahs of Region 10 (Upper Demerara-Berbice), according to the Ministry of Agriculture. The Mano Julio group out of neighbouring Brazil has already tested the soil type in the Intermediate Savannahs and had success with a crop of corn and soybean, and is expected to start cultivation again early next year. Upon full implementation of the project, the area will see some 5000 hectares of corn and soybean eventually translate into protein for animal feed and biofuel. 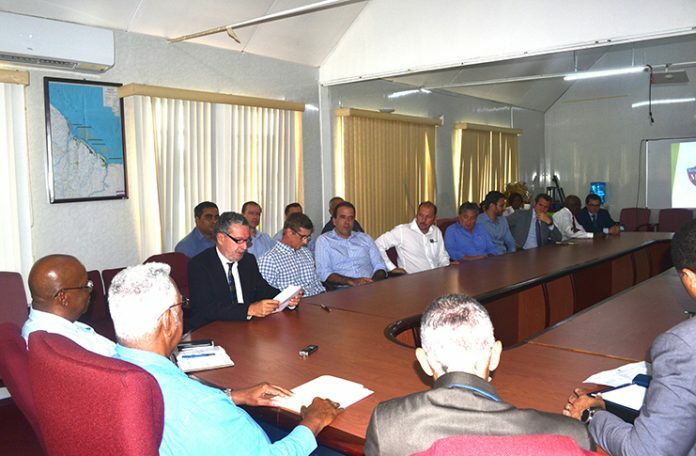 The vision of the investment group was laid out to the Guyana Government on Thursday morning during discussions with Ministers of Finance, Agriculture and Business, Winston Jordan, Noel Holder and Dominic Gaskin respectively in the boardroom of the Ministry of Agriculture. There were two video presentations in which the investment team showcased the transformation of the savannahs through the establishment of the mega-farm concept. Job creation, the transfer of skills and knowledge, export to major markets throughout the Caribbean and EU are just some of the benefits to be derived from the partnership between the Government of Guyana and the group of Brazilian investors. Phase One will comprise cultivating 5000 of the 50,000 hectares targeted for development under the proposed project, followed by the inclusion of value-added products into the equation, which will see the transformation of vegetables into animal protein and the manufacture of such agro-industrial products as bio-ethanol in Phases Two and Three. It was also discussed during the meeting that given the challenges with climate change and other traditional crops grown on the coastland, the government has long wanted to move agricultural production more inland, hence its decision to turn its attention to the Intermediate Savannahs, located some 60 miles from the mouth of the Berbice River and encompassing over 2000 square miles of territory. The Brazilians said that they too decided on the area at reference given its strategic location some 100 miles away from a main port, which would allow for ease of access to North America and European markets. Other key advantages they said are the similarities in soil type with which they’re already familiar, the plentiful supply of water and rainfall patterns, and ready access to the Atlantic through the Berbice River. As to what’s in it for Guyana, the investors say the multi-billion-dollar investment will see the creation of lots of jobs for Guyanese, the transfer of technology and a boost in science-based agricultural endeavours such as the production of biogas, glycerin, research institute, and general infrastructural development. The investment is also projected to translate to US$50M in foreign currency earnings annually, as much as 1000 jobs in direct employment and another 3000 in indirect employment, in addition to food security. It is envisaged that once the project gets underway, it will make Guyana self-sufficient within the first year, and by the end of the second year, the yield will be more than enough to supply the regional and international markets. “Our sustainable agriculture method will seek to integrate three main objectives, which will include a healthy environment, economic profitability and social and economic equity,” said Romeu Amaral, the investors lawyer. Also coming out of this investment will be contract farming for persons with large plots of land which are currently underutilised in the surrounding areas. Immediate and long-term economic empowerment will be a positive spinoff through this approach, thus improving the standard of living for the people in the community. It is also envisaged that with the economic opportunities that will abound in the area, it will become a magnet for Guyanese from all across the country. Talks are also in progress with the Environmental Protection Ag0ency (EPA) to ensure this project is rolled out in keeping with strict environmental guidelines. The Ministry of Public Infrastructure will also be integrally involved, as some key infrastructural projects will be vital in aiding this project to meet its full potential. Minister Jordan said while is enthused about the prospects presented by the investors, it is important that it moves from the concept stage to actual implementation. Minister Gaskin noted that the proposal is strategically aligned with the government’s trajectory for agriculture, which currently contributes some 16.2 per cent to the country’s overall GDP, to become a major contributor to the continued growth of the economy. The next step will see the formulation of a working group, which will include representatives of the Government of Guyana and the Brazilian Embassy and the Mano Julio investment group. Subsequently, the drafting of an MOU will be formulated. The investment group includes representatives from Granterra, NF Agriculture Inc, Castilho Construction and Mano Julio. On the government’s side, there were representatives from the Ministry of Agriculture, Guyana Lands and Survey Commission, Ministry of Infrastructure, the EPA and GoInvest. While in Guyana, the team paid a visit to the Intermediate Savannahs to have a look at the land earmarked for development. Already a high-level delegation visited Brazil and was given a tour of the operations in that country. and the government, but rarely into Delta communities.”- Citizen of Nigeria. Global hunger for soybeans ‘destroying Brazil’s Cerrado savanna’. Having seen the whole programme (which this video summarises) when it was originally transmitted on BBC TV, I could not believe that the Guyana Government would contemplate such a proposal unless it is living in an uneducated state of glorified ignorance. The programme details that the local Brazilian people are direct descendants of African slaves. A middle aged woman (did not wear spectacles as the other woman shown in the video) complained that she could not understand why outsiders were profiting from their land and likened the working conditions and low wages as akin to slave labour. Her distress was palpable. The plot shown under cultivation with soya beans sweeps up to their homes (shacks, really). The land has been flattened for miles around and there is no other source of local employment. What the Guyanese proposal does not say is that local residents will be forced to work for the same low wages as described in the programme. I would not be surprised if it is the same commercial Company involved in both Brazil and Guyana. The Brazilian area shown in the programme is South of Guyana’s southern border. Inviting non-English language speakers into Guyana will cause local friction sooner or later, with a ‘them and us’ attitude. Any pollution of a major river through unregulated transport and destruction of a pristine land mass should not be countenanced by any Government unless it wants to leave behind a legacy of undying contempt by future generations of Guyanese. No Government should misuse its own citizens as a source of cheap labour for the benefit of foreign investors. This project should be cancelled. Yuh cyant get house lot that easy, but wealthy foreigners have access to our lands.